Wendy teaches classes in needle-turn applique, using the backbasting method. 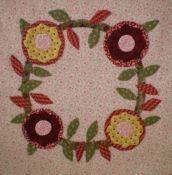 Classes are also available for many of the pieced quilts shown on the site. The locations and dates of classes will be listed as they become available. Classes are mainly held at local quilting shops around Adelaide, South Australia. However, I am prepared to travel if the invitation is made. Get together a group of 4 or more and I will come to you! !